Happy National S’mores Day! Will you be enjoying the campfire treat today? Truth be told, I had my first actual s’more last year and I must admit it was pretty good. I am not a big marshmallow fan so I think that’s why I never tried one, also, I’ve never been camping. Although you don’t have to go camping to have a s’more. Last year friends and I made them for dessert after a BBQ by roasting the marshmallows over sterno gel chafing fuel. Believe it or not, it actually worked! For today’s s’more treat I made S’more Brownie Bites. I started by making the brownie batter. I melted a stick of butter in a small saucepan and then added in mini chocolate chips and whisked it until it was melted and smooth. I transferred this a medium bowl and stirred in sugar, eggs and vanilla extract. Using a hand mixer I then beat in all-purpose flour. And finally I stirred in mini chocolate chips. Now, the recipe called for quinoa flour along with all-purpose flour. I decided to omit the quinoa flour and just used all-purpose flour. I honestly didn’t want to spend money on quinoa flour which I probably wouldn’t use again and it didn’t seem necessary to the outcome of the recipe. I even researched making my own quinoa flour, but, it just didn’t seem worth the time and effort. Sorry if I sound so negative, but, I’ve finally learned that tweaking a recipe to the ingredients you have on hand is obviously much easier but also builds one’s confidence in the kitchen and you truly learn what works and doesn’t work. Back in the day, I would avoid a recipe if it included an ingredient not readily available or a bit on the pricier side, but, now I look for ways to make the recipe work with what I have on hand. Once the batter was ready, using a small cookie scoop, I filled a mini cupcake pan, which I lined with liners, with the batter. 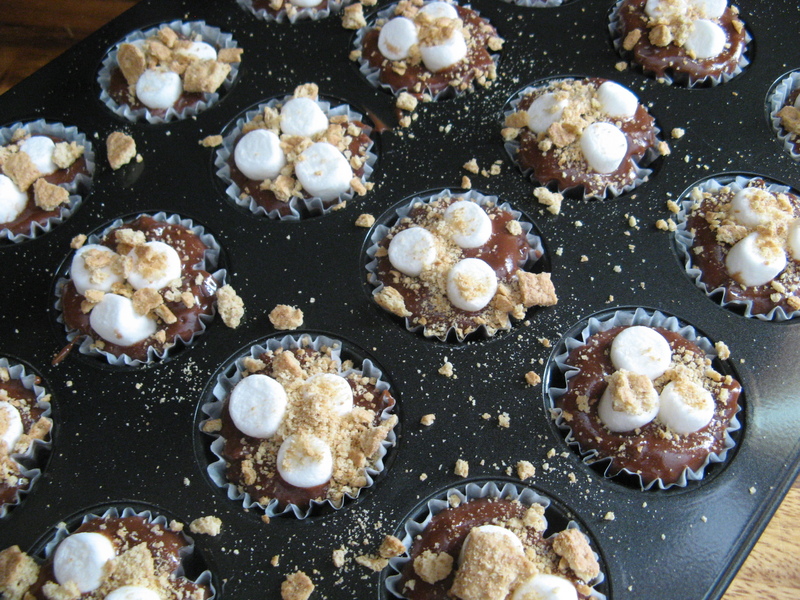 Next, I pressed three mini marshmallows into each of the brownie bites and then topped them with crushed graham crackers. Here’s my simple trick for crushing graham crackers… Break them up a little and add them to a quart-size Ziploc bag. Seal the bag, removing the air, and then using a rolling pin, roll the graham crackers to crush them to your desired consistency. I opted to leave the graham crackers with little pieces to give the tops of the brownie bites a little texture to them. After baking in a 350 F preheated oven for about 12 minutes they were ready! One downfall of baking marshmallows is that they melt considerably, so removing the brownie bites from the pan wasn’t as easy as just removing basic cupcakes. I let them cool for a few minutes before removing them so that could have been part of the problem, but, I also didn’t want to remove them right out of the oven since I wanted the brownies to settle a little before removing them. Removing them too soon could have resulted in smooshed brownie bites. Regardless, they still tasted yummy! The extra mini chocolate chips in the batter really added another level chocolate goodness to the brownie part and the marshmallows were perfectly melted into the brownies. Preheat the oven to 350 F. Line a mini cupcake pan with papers liners and set aside. In a small saucepan, melt the butter over low heat. Remove from the heat and add in ¾ cup of the mini chocolate chips. Whisk until the chocolate chips have melted and the mixture is smooth. Transfer to a medium bowl and whisk in the sugar, eggs and vanilla. Using a handheld mixer, gradually beat in the flour until the mixture is smooth and thick. Finally, whisk in the remaining ½ cup of mini chocolate chips. Using a small cookie scoop, fill each paper line with the batter. 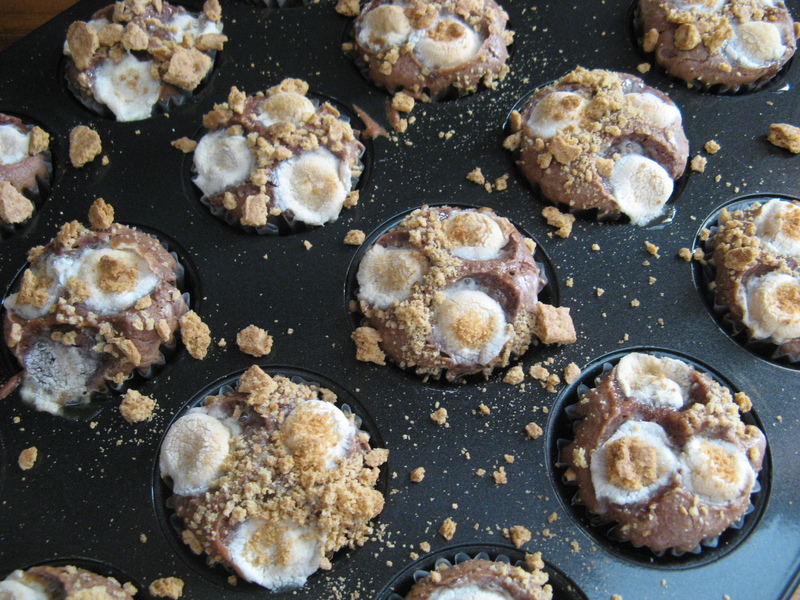 Press 3 mini marshmallows into the center of the batter and then sprinkle with graham cracker crumbs. Bake in the preheated oven for 10 to 12 minutes, the marshmallows will be puffed and lightly golden. Let cool for 20 minutes and enjoy!